I will always treasure your tips regarding casting, fly placement and presentation, and how to cover the water effectively. Was a real treat to make that first cast so close in the fast water, instead of bombing the fly across the water, and that nice fish taking the blow fly right in front of me! You are a special friend now and we will always treasure our day on the water with you! Chris taking the special time to help Lauralee make better casts. Thank you! Thank you Kris & Lauralee for your review. 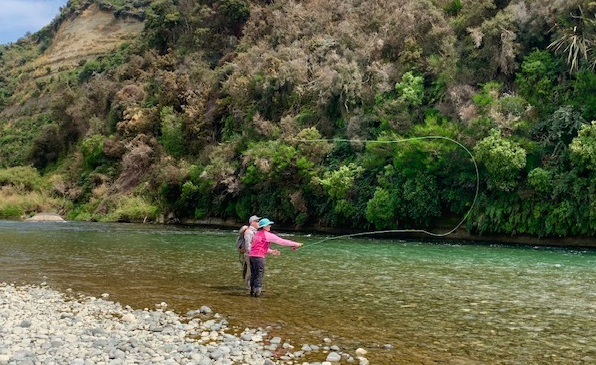 Another great day fly fishing in New Zealand. A recent review - This is 10 year old Rileys write up. Me and my Dad flew into New Zealand hired a car and drove into Te Anau where we had hired a house with my granddad, grand uncle and Dads sister. we met our guide the next day, Chris. On our second day Chris picked us up and started driving to a different place, where we tried willow grubbing, it was willow grubbing because the grubs would fall off the willow trees and lived on the river bank, the trout were very fussy and would not eat the grub, it was very technical casting, you had to present it well or else the fish would not go for it but we kept on trying until they stoped feeding and the fish went away so we went to a different steam and me and my Dad had a fish while Chris went back to the car to grab lunch. When he came back we sat down and eat our lunch. Then we went to a different river were I landed my first fish! A 4 pound rainbow! It was very exciting and the fish tried to bury us under a fallen tree but we were able to stop him and eventually the fish gave up and Chris scooped up the fish with his net we took some photos and then we released the fish we went back to the car and drove home I was in a very good mood. On our third and final day Chris picked us up again and drove to a very beautiful place trees towered over us which gave the car good shade you could see mountains all around us and at one point it got really cloudy and you could only see the mountain tops. 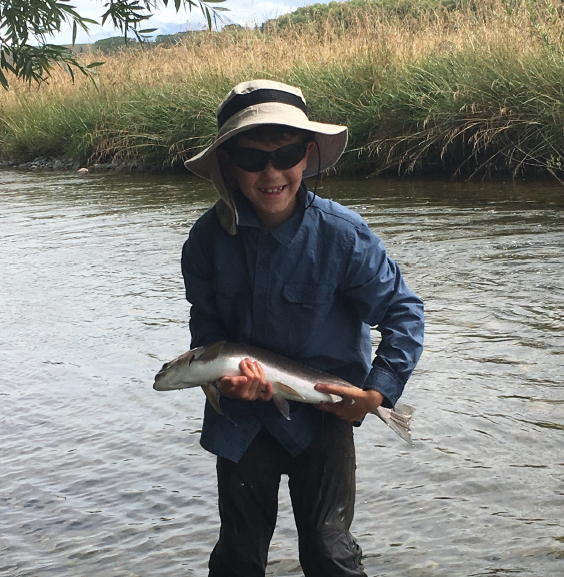 We hopped down to river were there were a lot of fish but sadly they were very fussy after fishing there for a while Chris spotted a giant trout who wouldn’t go for the bait so we went and crossed a river and started walking through some scrub. We were walking until Chris spotted a fish, Dad tried to have a go but when he hopped down the fish swam right up close, Dad stayed really still because Chris said it was because the fish thought Dad was a tree! Dad stayed really still but he moved his right foot and the fish ran away. After walking though some more scrub Chris spotted another fish which Dad had a go at and caught! The trout had been sitting behind a white rock waiting for the grubs to float down and put up a good fight, even made some jumps but Dad was able to pull it in and Chris scooped it up with his net. It was a 3 pound brown Dads first fly fishing fish! After having lunch we made our way to a steam we had a fish but did not catch anything so we headed back though the scrub and crossed a river because Chris had spotted another fish which I landed! It was a good fish as well 4 pound brown second fish I’ve ever landed! After we took some photos we started heading back to the car. Each time we got back to the car Chris would have an ice water ready for us which was great and the best bit was being able to take off my water boots and give my wrinkly feet a rest. It was a very good fly fishing experience. Very proud of you Riley. Thank you so much for your awesome review. You were so patient, understanding and polite. It was Epic ‘Young Fella’.. Thank you to the Carney Family for a great 3 days. The start of the season is well under way here in New Zealand. The 1st of October sets the scene for the season ahead. If you weren’t out fly fishing the Winter season you’ll most likely be gathering your gear and making sure your licensed for the 2018-19 season. The start of the season is always depicted by weather and this seasons start was no exception, dominated by sub polar cold fronts. We experienced snow to ground level across the lower South Island of New Zealand early October. This has added to a consistent snowfall through out winter. 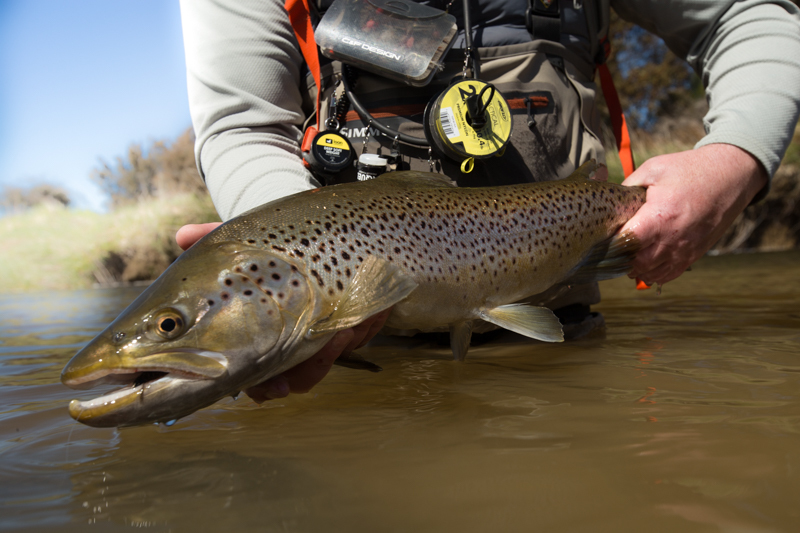 This is good news as fish looking to spawn have been provided with consistent water levels. Excessive rainfalls or floods during winter can make a huge difference so it’s good to see consistent levels. Things have started to settle. High pressure periods have started to show with the usual NW winds showing face. Sunny days have warmed the water and fish are back on the feed. 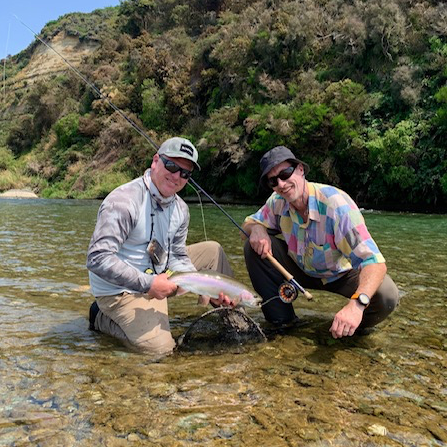 Working in the local Fishing Outfitting Store @fiordlandfrontiersupplies I picked out the best weather to get out and experience early season at it’s best with my mates…..